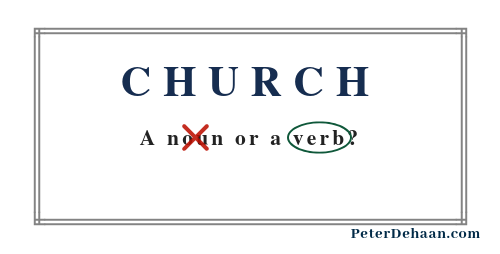 Yes, I know that linguistically church is not a verb. A verb indicates action; it shows movement. Church falls in the noun category, specifically a place. Places don’t move. They have no action. They don’t do anything. Most places, in and of themselves, are boring. It’s what we do there that makes it interesting—or not. Likewise when we attend church, it’s what we do there that makes it interesting—or not. So when we sit passively in our pews, sans action, church becomes a rather uninteresting place. The operative word is boring. As a kid I often complained that church was boring, but I thought I would one day move past that—when I grew up. I guess I never grew up because I still think church is boring. So church, at least the church service, becomes something I strive to endure. It’s not that I don’t like God. I do. It’s the church service I don’t care for—or at least what we’ve wrongly turned church into. Go to Church: Going to church is an action, but sitting down once we get there prepares us for inaction. Something’s wrong. I go to church to spend time engaged with others, not staring at the back of their heads or expecting a select few to entertain me from the stage. I want to interact with other followers of Jesus: talking, listening, praying, and caring. This is true community. When I go to church I seek meaningful community. If not I might as well stay home, where I can at least access better sermons and music online. We go to church to be part of an active community. Do Church: A popular sentiment among many forward-thinking believers is “doing church.” I get that. They desire to move past passive sitting and replace it with active engagement. Though we can sometimes do this, at least a bit, when we sing to God, it’s quite challenging to accomplish during the lecture part of the service. Instead of passive inaction when we attend church, we need to do things. We need activity to chase away the boring and make church worthwhile. We do church to interact with other followers of Jesus. Be Church: The third church action is being, as in to be the face and hands of Jesus to others. Jesus said he didn’t come to be served but to serve (Matthew 20:28). We should do the same. We help, we reach out, and we love – just as Jesus modeled for us to do. While “go to church” and “do church” have an inward focus, “be church” has an outward emphasis. It suggests giving to others outside of our community. We give our money to the world around us; we use our time to help the people near us. This is how we best model what Jesus did—and we don’t even need to attend a church service to do it. Why do you attend church? What changes should you make?